Some people are amazing, I was talking to my friend Sandy this morning and she mentioned how after each birthday party she starts planning the one for next year. Wow, that's really organised, like really really organised. I can't compete with that. Poor Sophie got 2 weeks of planning for this one. I was still in recovery from Lilli's party when my sister in law asked what date we were actually having Sophie's party as her birthday was about 2 weeks away. But it's ok, I do some of my best work under pressure, I already had in my mind that we would be having a Wizard of Oz party, as my newly 4 year old really does make a sweet Dorothy. I just needed to invite some kids, come up with some party games and think up / make some themed party food over the next 2 weeks. Piece of Rainbow cake (hehe). Although truthfully the rainbow cake was no piece of cake at all, actually quite a bit of work there but it was adored by Sophie who made suitable 'oh wow' noises. Oh and look at that tiny triangle of violet cake at the top left after I carved out the shape. Honestly what kind of idiot would bake a whole layer of cake for that..........Well I think we all know. Doesn't look quite so crazy from this angle, but we all still know how much violet there really is don't we. 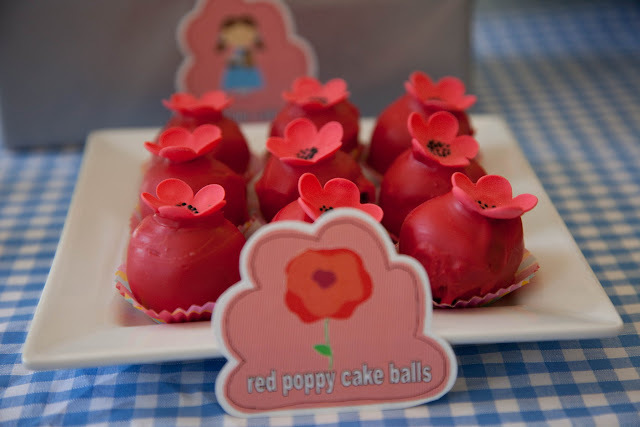 Of course the ever wonderful and talented Terri my sister in law made the pom pom decorations, labels and took the photos as well. Farmhouse rainbow cake - yup it really is rainbow inside. 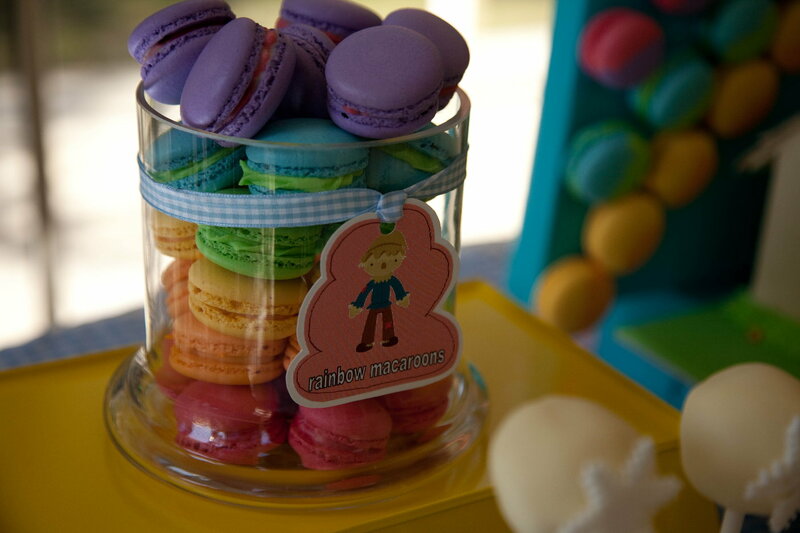 Rainbow Macarons - served in a jar and also two tone rainbow feature behind house. Filling included peppermint buttercream, raspberry ganache and orange ganache. 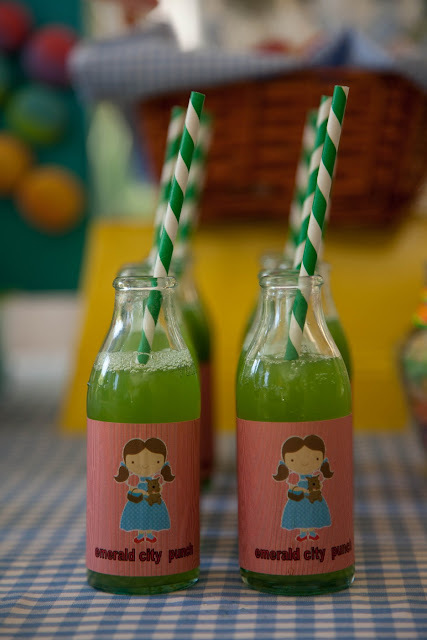 I got these cute little bottles from Imprintables click here for link and you can get the striped straws there as well, from Details Details or Paper Scissors Rock Stationery. You can actually get these bottles yourself by buying them still filled with juice and then soaking and scrubbing the labels off, but I don't drink juice and I don't like scrubbing so totally worth having Imprintables do that hard work for me. I really wanted some little baskets to have as my loot bags. I saw some on Sharnel Dollar designs that were perfect but alas they were all sold out. I did get lucky at Ikea, Puppy hand puppets on sale for $2.99. Toto cute. and some rainbow coloured fruit rings. 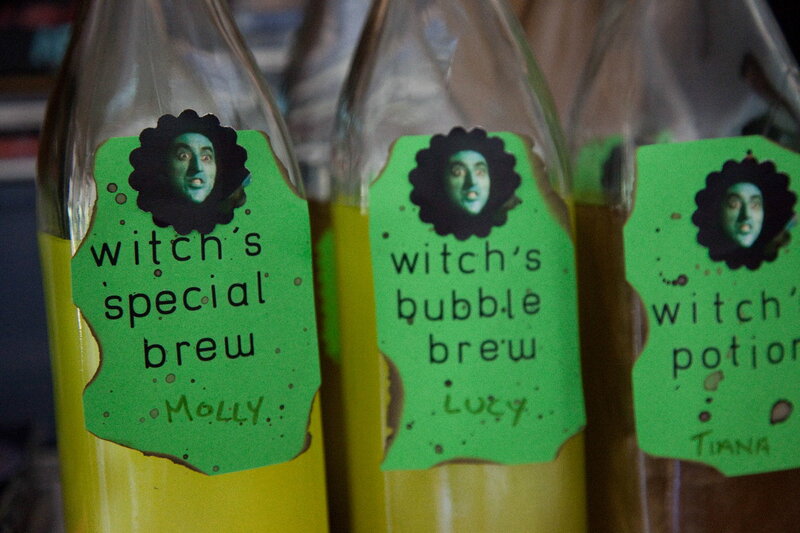 Wicked Witch Poison Potion treasure hunt. I decanted bubble bath into these bottles ($2.49 from Crazy Clarks) and stuck some witch pics onto them and the kids had to find them in the garden. Musical Statues (Sophie's game pic) kids dance to the music and freeze when the music stops, players are out if they move.... you know the drill. Everyone got a Wizard of Oz colouring book which was free colouring pages off the internet. 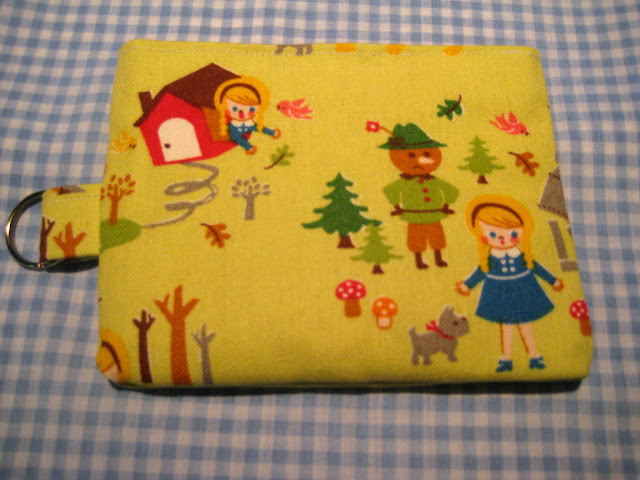 The winner got this lovely pencil case from The Little Orchard on Etsy. Funny thing they also make felt brains and hearts which are kinda realistic and could fit in with this Wiz of Oz theme. 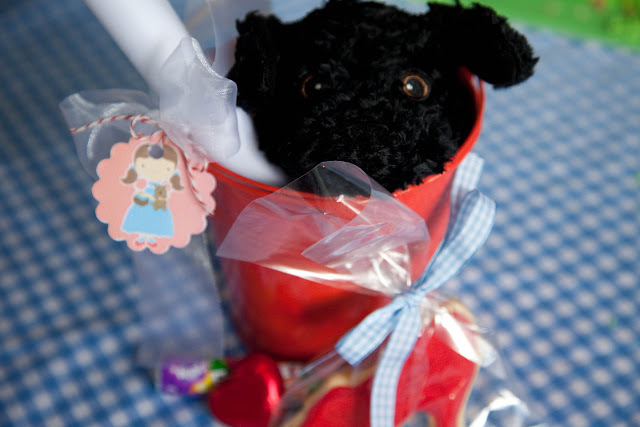 Pass the Picnic basket - it's not a party in this house without pass the parcel. 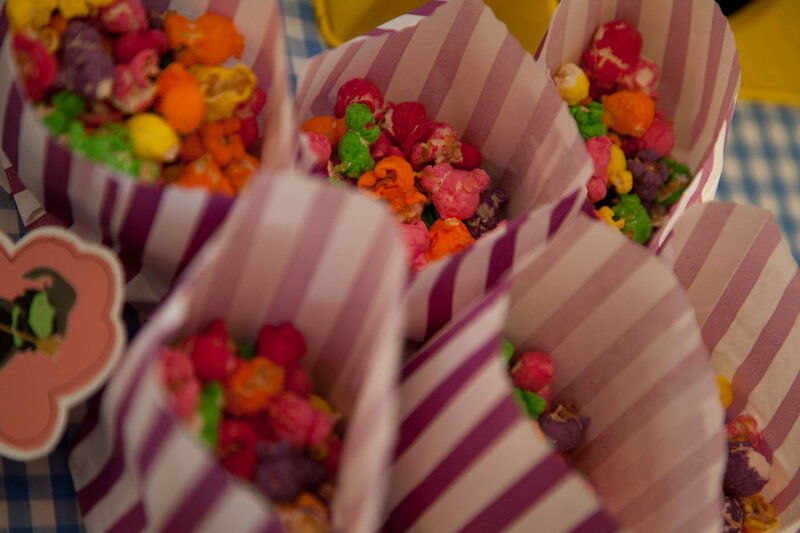 Prizes were individually wrapped and each guest picked an appropriate coloured prize when the music stopped on them. Emerald city necklaces, candy and Dorothy hair clips. Ooooh look at these vintage Wizard of Oz dolls my mother in law found, kinda creepily cute aren't they. 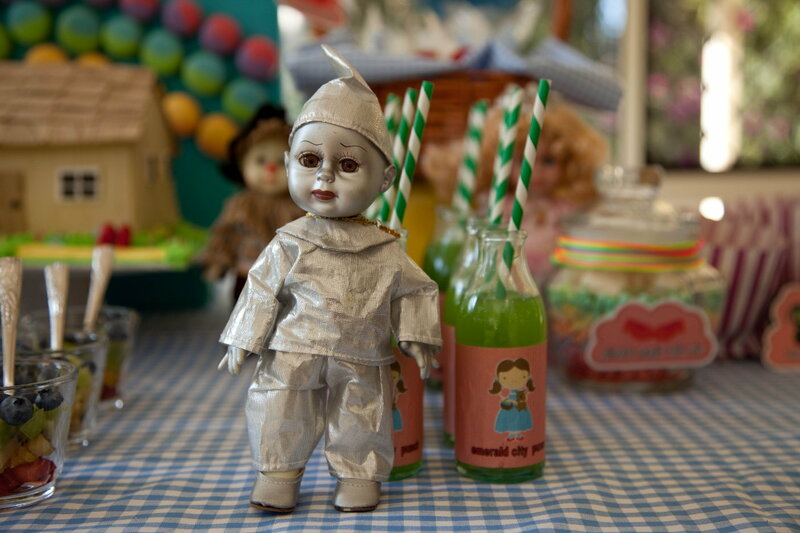 I liked the tin man the best....Still they went home with Nana I couldn't sleep with them in the house. After the party was over I asked Sophie what the best part was. "All of it" she said making big wide arm motions, melting my heart and making all the work seem worth it. Hope to share some more recipes soon. How I wish I can be Sophia :p. I cannot let my daughter see these, if she request a party and cake like that, I will have heart attack hahaha... 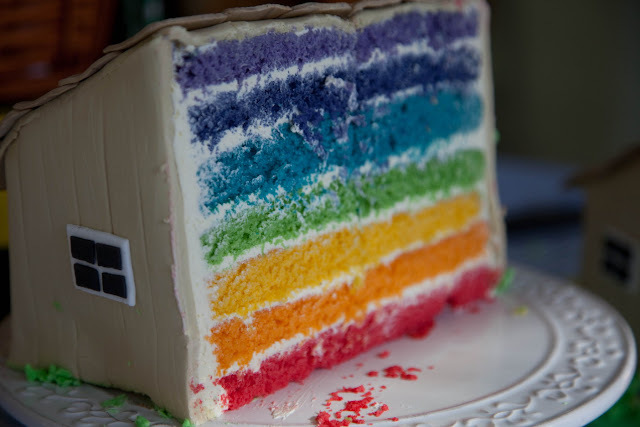 I love your rainbow cake, so colorful and bright, but must be tedious to make so many layers of cake, impressive! I love it!!! My dd's birthday is coming right up & I have no plan beyond a fairy cake! This is fabulous inspiration & it looks as if you put oodles of thought into it right down to every last sweet detail! awww how sweet! 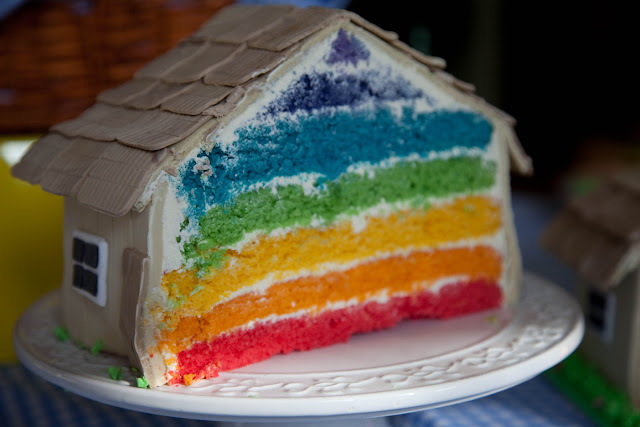 I LOVE the rainbow cake inside the house! genius! Great details! WOw! What a wonderful party. 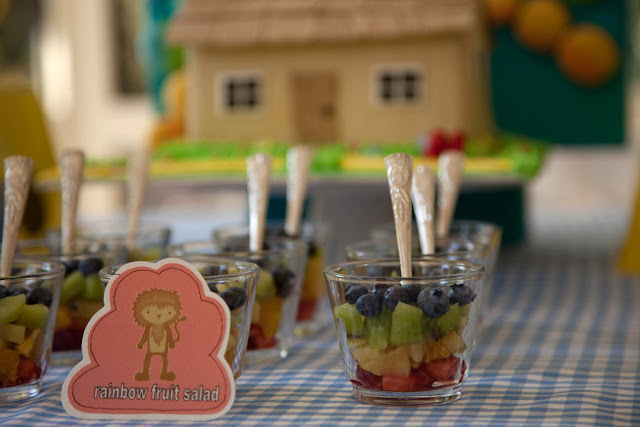 Very inspired, and very beautiful, and the rainbow layered cake is just stunnign! amazing! the cake is so impressive. It looks like a lot of work. I love it. 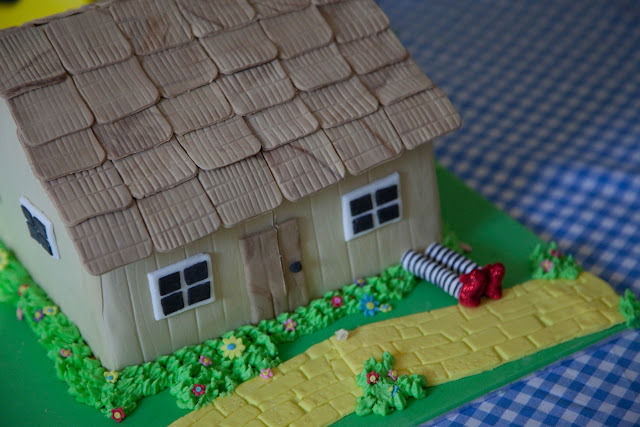 I especially like the little legs poking out from the house. Such attention to detail. Thanks for linking to my page Linda! That party looks ToTo fun! to steal your joke hehe! Wiz of Oz is a fave of mine! Happy Birthday to Sophie and the best present is having a mom that would create such an amazing party! Wow! I want you to do my next birthday party! Please? Love the house (with the legs!!) and love those gorgeous macs! How ever did you know that we'd have this movie theme at Mactweets! Thanks for both your fabulous entries! Happy Birthday Sophie! You really go to such great lengths with your parties I bet your kids have friends just dying to attend a party! Love the rainbow house (you've done two things today that I am doing as well ;) ) and the green and white straws are gorgeous. Are they wax straws? Amazing! The detail in everything is just beautiful. And what a beautiful Dorothy! What a great looking party. I love all the colors that you used! It makes her party that much happier! Holy crap! That's an AMAZING party! 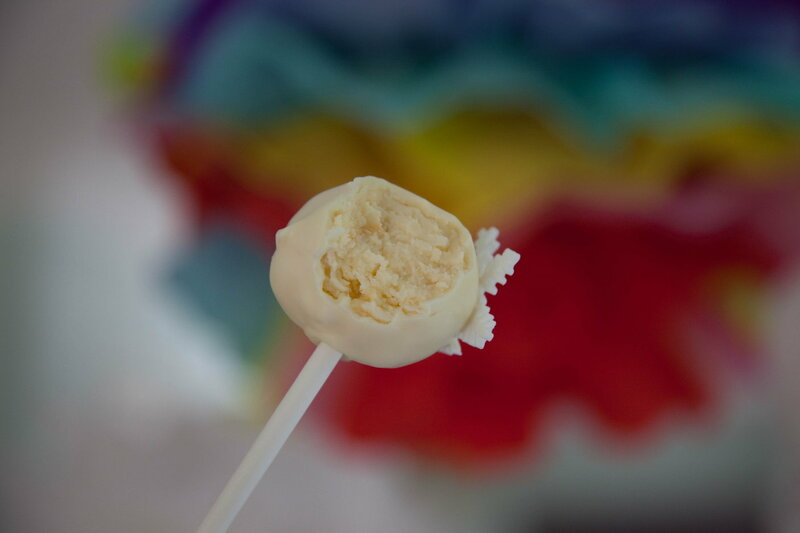 I used to get a bunch of balloons and an icecream cake and was thrilled! Everything looked so professional! Mind. Blown. Ummmm.....would you like to be my Mom for my birthday this year? This spread is AMAZING. I hope the kiddos had a great time! I'm scared to see what you'd do if you spent a year planning this party. This is absolutely incredible, and your daughter is way more adorable than Dorothy! Gorgeous. You certainly do work well under pressure! That turned out really cute!! The cake is amazing...don't think I didn't notice the witch's legs sticking out!! Love it! Some really precious details here, but I LOVE the rainbow macarons! I am in awe of all this fabulous & colourful work you've put in - but what results. Wow! (You can tell I've never 'done' a birthday party before can't you....!? ); Well done, there's a lot of work that's gone into this. Oh., and Happy Birthday beautiful Sophie. wow this looks like the most amazing party ever! shes a lucky little girl hehe, i cant believe how great the rainbow cake looks!! My word, this is the best Wizard of Oz theme/tribute I have ever seen. It's whimsical, clever and oh so beautiful. Sophie is the luckiest girl to have a Mom so talented. Linda, that rainbow cake is INCREDIBLE! You are amazing. The layers are perfect, right up to the violet one. And the wicked witch's legs sticking out are a hoot. We must be on the same wavelength. My Sophie's 3rd birthday is in 2 weeks and I've just ordered the straws and have been scrubbing labels off those little Italian juice bottles. Too funny! What an awesome party! 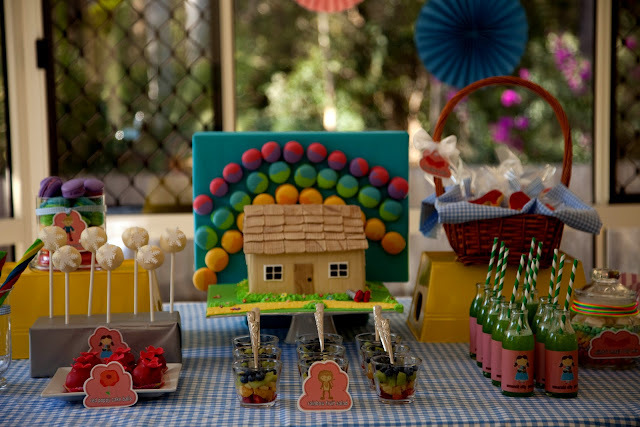 I especially like the rainbow cake and the little witch legs sticking out from under the house. It's all great! I'm sharing this with my daughter who has little kids who would think this is the best party ever! I can't get over how beautiful your parties are. I think your obsession i.e baking a whole layer for indigo, is just gorgeous! You have the luckiest daughter in the world. What a beautiful birthday, full of tons of magical treats. in my day, we were lucky to get a birthday at McDonalds LOL. How I love your cake! Soooo jealous of your party skills. Well done. OMG you are an awesome mom! What an amazing party! Hope she had a wonderful time. This is totally gorgeous Linda. I love the cake, it's adorable. Oh Linda this is just fantastic! I have admired your other beautiful parties, not sure how I missed this one! 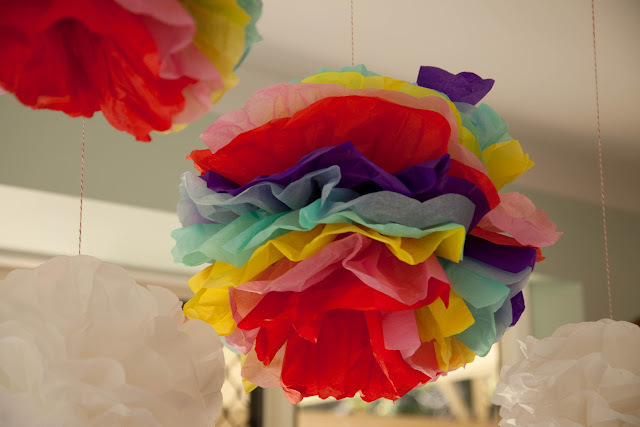 I'm having a rainbow party for my daughter in December, and my inspiration is growing! I've been planning to do the rainbow layer cake too, but mine will be plain old round and white. I'm quite terrified of the whole layer thing not being a baker, so if you thought it was tricky there's no hope for me!! I ♥love♥ those rainbow macarons ... did u make them? I was wanting to have rainbow choc dipped cookies, but chocolate in Brisbane in December would not be a good mix, and I have been searching for rainbow macarons ever since!! Can't wait to see the next party! WOW! That cake, those macarons...WOW! 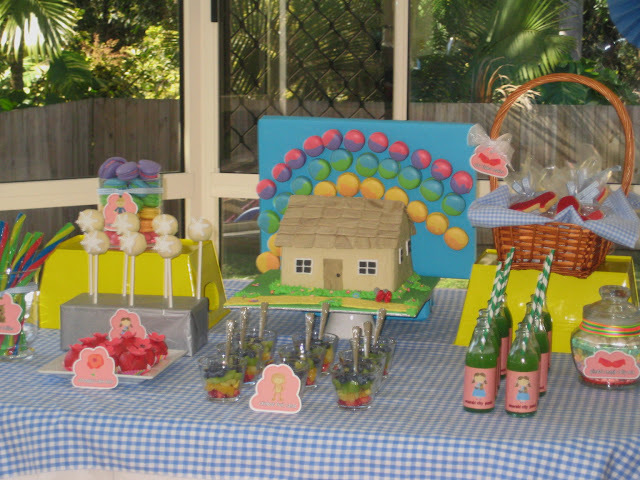 Hi Linda, I have just stumbled across your blog and absolutely love the idea of a wizard of oz theme party - you did a fantastic job. 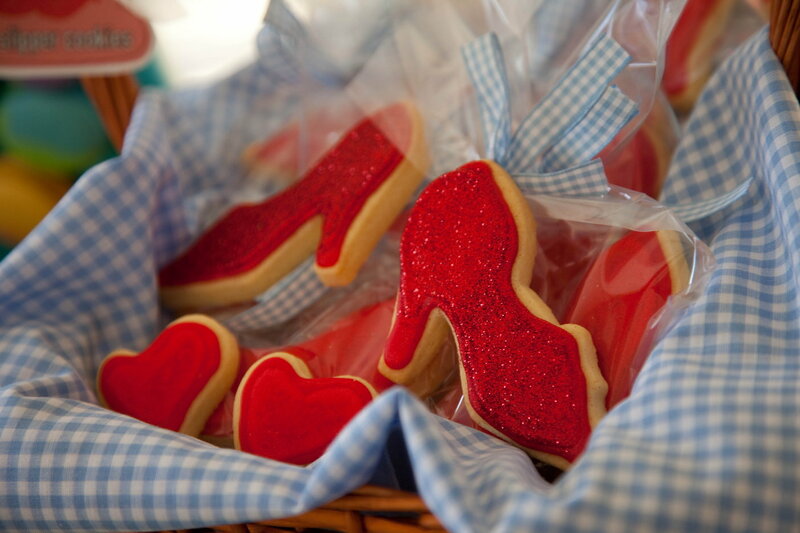 The ruby slipper cookies are my favourite! Wow, what a sweet party. I love everything!!! I must ask where did you get the labels for the glass bottles? Oh my goodness i am now feeling very inspired for for my daughters brithday, though its not until september so i might to check in here again to become inspired all over again. And i love that you baked that tiny strip of purple! Oh my..the other mums must hate you! LOL - I think you are amazing. Please adopt me. I want a party like this. What a whimsical, magical and creative Wizard of Oz party. Every detail was so well thought out and executed! I love your creativity! 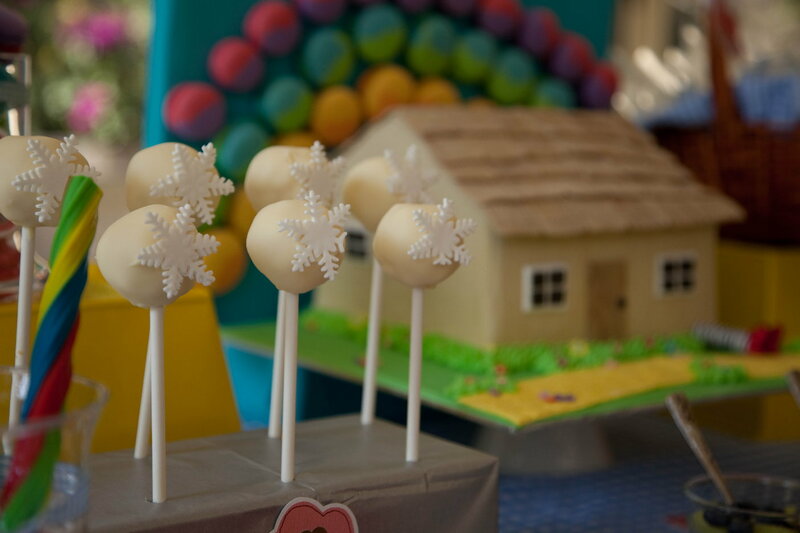 The rainbow cake house and the poppy cake balls are some of my most favorite elements! My girlfriend is planning a Wizard of Oz party for her daughter. I'm so happy to be able to send her your link! I will attempt to make the same cake for my sons friends birthday. I just loved the idea, so funny. I am a bit scared about the rainbow part. How did you divide the batters? Did you use square cake pans? I don't have 8 pans! Can I use 3 and wait till it cools, reuse for the rest? Would the batter go bad if it sits on the counter for a while? I weighted the batter and then divided it up, It was a pretty big cake so it was a double mix of batter. I made the batter in half batches and then let it sit in the fridge while the other lot was baking. It is best to bake immediately but I seemed to get away with it. Hope you all have a great time at the birthday party. That's funny I am one of those people that plans way in advance. My daughter already has me planning two themes for next year just in case she changes her mind. Wow - I LOVE it all!!! This was an amazing party and such an inspiration for me! The cake, poppy cake balls, and sugar cookies are my favorites! 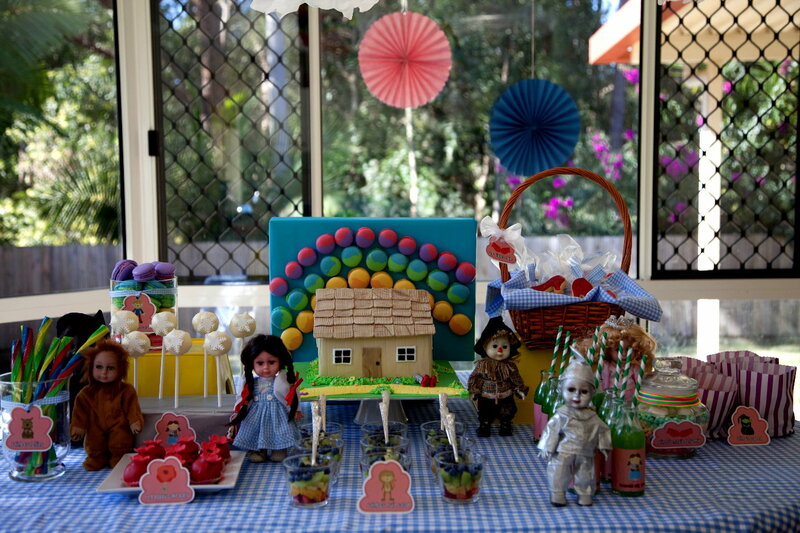 My daughter also wants a Wizard of Oz birthday party. It'll be at the beginning of November. 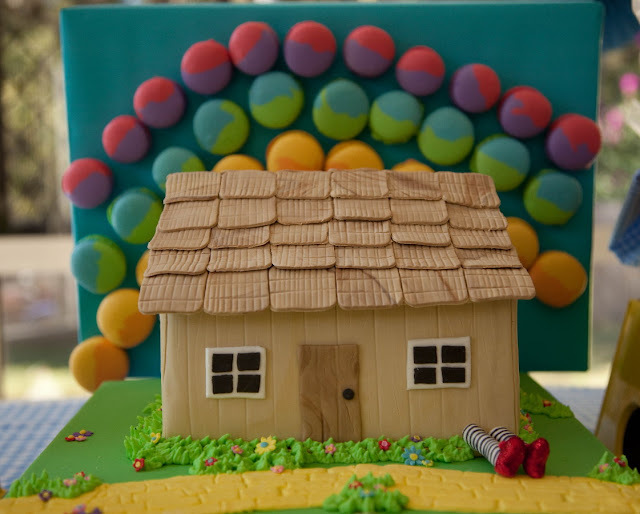 I would LOVE LOVE to replicate the rainbow farmhouse cake. My hubby and daughter also adore it. We attempted it last night but I didn't make enough white cake batter so my farmhouse was not tall at all- It was a huge flop and waste of ingredients! If you don't mind answering I have a few questions about the cake. What size square pan did you use? Did you use box cake or a white cake recipe of your own? If it was your own recipe - would you mind sharing the recipe? Did you double or triple the recipe? If it was boxed cake did you divide the batter into two pans? Did you use fondant or gumpaste to add the details? I hope you are still blogging and can help. Any help would be GREATLY appreciated. I REALLY want to make this cake for my daughter. I can be reached at tlmswt2000(at)msn(dot)com just replace the words at and dot with symbols. Wow, I know this was a while ago but this is absolutely incredible. Everything you made is absolutely amazing. 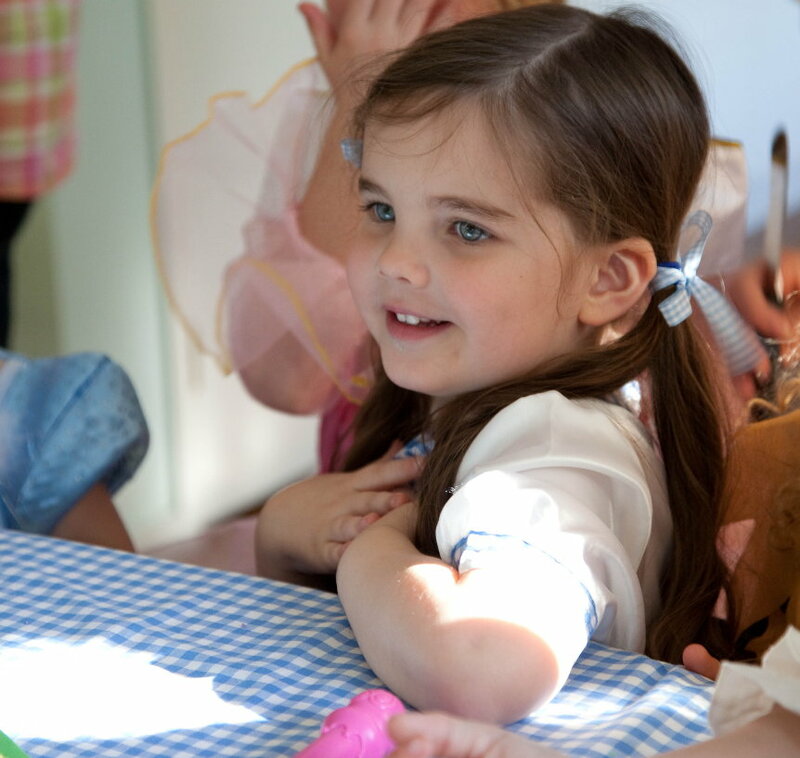 What a fantastic party for your gorgeous little girl. I am WAY behind, but this is the bestest Wizard of Oz party ever! That cake is stunning and utterly perfect. Love it. failed to make this that cake I used the Martha Stewart and the cake went all dry and the buttercream wouldn't whip.